“It speaks, even if its language is only creaking and cracking noises for the profane. Its wailings are evidence of an attack by hostile forces. … The house establishes a bond between itself and its inhabitants,” he states. Uncared for, a house will die. Expressions in our lexicon echo the importance of this bond: to have a roof over one’s head, to take someone out to the woodshed, to be on the threshold of life, to throw something out the window, and if you can’t stand the heat, get out of the kitchen. Many old customs have been mistakenly thought of as superstitions, but Lecouteux traces them back to their origins. “[F]olk beliefs have extraordinary longevity and barely evolve as long as social and material conditions do not change,” he wrote. For instance, the place a house was built was carefully considered. It took into account the place spirits and signs of good fortune such as where a coin was found, the place animals lay down, or the site where inhabitants had previously lived and had good fortune. Roadsides were typically preferred. The borders of fields were avoided. So were crossroads, sites where a house had burned down, former cemeteries, places where animals had had been killed, anywhere someone had committed suicide or a spot with an unmovable stone, Lecouteux tells us. In various cultures, permission was required from the earth spirits before a house could be built, salt was used to bless the spot before construction, and work ended if, while placing the first beam, an ax generated a spark. Everything from the houses’s orientation, and the placement of doors and windows to the materials used and the sacrifices made were important to people. When and how they moved in was also dictated by a series of beliefs. “Every element of a building possesses magic and religious meaning,” Lecouteux states at the start of chapter two. The walls, the gutters, the roof and the corners were all associated with various traditions. There were rites and blessings, customs and ceremonies and taboos connected with every aspect of a home. Entering a home is done by crossing a threshold, which can be considered a rite of passage. What must not leave by the door, but rather passed out a window were also closely followed – all so as not to anger the spirits and bring about misfortune. The French medieval scholar specializes in Europe during the Middle Ages, covering many esoteric subjects in his more than 15 books. He researches using source texts in the several languages he knows. That way, he explained in an interview in 2016 with Ben & Sol, he can correct assumptions others may have made with extrapolating information. 77 sayings and beliefs are listed in the appendix – including “The spirits are granted the space between the doors, they should therefore never be slammed” and “When a person dies, the windows of a house should be opened so that the soul can leave” – along with footnotes and a bibliography. As a teacher of Norse Shamanism and Germanic mythology this is one book I was delighted to receive and hold in my hands! It is a beautiful hardback book with many illustrations. As an encyclopedia it is not so much a book most people will read from A – Z (quite literally as it is organised alphabetically!) but it is a book to dip into when you are checking a reference. Maybe the name of an obscure god, or a symbol you cannot quite place … and so forth. Who were Hvedrungr or Eyrgfjava for instance?! A few decades ago, in secondary school, I had a teacher of Latin and Greek who was an absolute stickler for accuracy and for using faithful reproductions and spellings of names or words from foreign languages. He taught in Dutch, in the Netherlands, where I grew up. His attitude ignited something in me that has stuck with me for life and today I suspect I sometimes bore my own students with authentic if inaccessible spellings of names taken from Old Norse or classical Greek!! For that reason I was pleased to see that the publisher and editor have taken great care to honour original orthography (fancy word for spelling!) There is even a note on correct pronunciation of letters from Old Norse and contemporary Icelandic. What I did next was leafing through the book to check entries on terminology and more obscure figures (in Germanic mythology and folklore) where I have been disappointed in other reference type books I have consulted. That was the “litmus test” for me and this book passed with flying colours. It is obvious that a lot of scholarship and research has gone into compiling this. The author has not just taken entries from other sources and reproduced them uncritically. Before the actual encyclopedia part there is a lengthy introduction of Norse and Germanic Mythology and Folklore. The sources are explained, the gods are introduced, the historical context is provided, even the runic letters are introduced and reproduced. The author takes great pains to explain that the various Germanic or Nordic countries did not all share the same course of historical development over time. This is very important because, as a teacher of this material, I know that many students arrive looking for a “correct spelling” or “historical accuracy” on various matters – and this simply does not exist. I always reply with a question, when people press me on this: what language are we in? What location are we talking about? What period are you referring to?! – This is material from a vast geographical area (with many local tribes and sub cultures) stretching across centuries (where material continued to evolve over time). I have not yet read all entries from A – Z. (I am working on that!) but I am thrilled to say that I am very impressed by all I have read so far. This is a book I will keep at hand and make available to my students of Norse mythology, Germanic folklore and shamanism! I expected The Secret History of Poltergeists and Haunted Houses to be little more than a collection of reports of the paranormal. I was surprised to find this book to be much, much more. 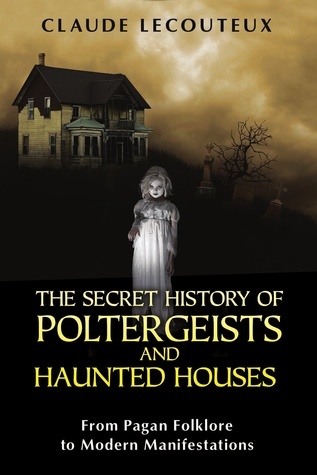 To start with I learned that while spirits that make noise, usually knocking noises have been around for quite some time the term poltergeist is relatively new; first appearing in a dictionary in 1540. The first chapter of the book is devoted to explain what a poltergeist, or what we have come to label a poltergeist has been defined as through history. The following chapters offer examples of these noisy, often mischievous spirits. The author shows how they have been thought to be spirits of the dead, devils, part of witchcraft or a hoax. The chapters cover an age of writings or folk legends of poltergeist and include the Middle Ages, when these were thought of as mainly the dead, devils, brownies and more. Not only are tales of the phenomenon and often how these spirits were banished there is also a generous amount of other information included. There is also a chapter devoted to poltergeists that targeted individuals. Even the appendixes are extremely informative with a sample of an exorcism ritual and writings on haunted houses. I found this book to be both fascinating and informative. For those who are interested in more than just ghost stories this book is great.